Dear Susana Fernandez, EENI- Director of International Relations. I have the honour to inform you that I won a regional competition organised by GIM UEMOA for the staff of banks and financial institutions in the UEMOA /WAEMU (West African Economic and Monetary Union) region, for the proposal of a generic name for a new prepaid card. The proposed name is GIM BARAKA, meaning in many languages of the WAEMU (West African Economic and Monetary Union), the Blessing, the Virtues, the strong core values and ancestral sought by all the Africans. 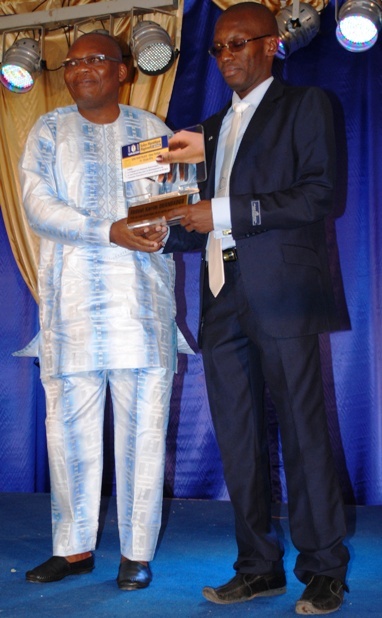 On June 19, 2014, I was awarded the prize GIM UEMOA in the presence of the Governor of the Central Bank of the West African States (BCEAO) and various African monetary and banking authorities. This award is dedicated to all my professors at the University of Ouagadougou and EENI School of International Business in Spain. In fact, the training received in the area of International Business and Marketing in Africa, allowed me to improve the choice of the brand BARAKA based on my knowledge acquired on the Master. I am very proud, and I want to share this award with all my professors. Some photos of the ceremony at the hotel KING FADH PALACE (Dakar). 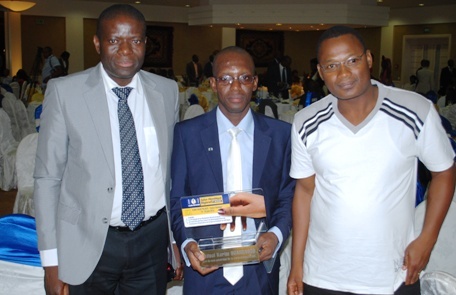 Abdoul Karim Ouandaogo (centre), with the CEO of GIM UEMOA (left) and Chief Information Officer of Banque Commerciale du Burkina (right).